"Someone helped me see my spirit is in my clothes. When we create, we put our spirit in the outfit - share that spirit with other people - just as in traditional garments. All have spirit, and the art we create is symbolic and we carry the outfits in high regard. There is power in what we wear." Tracy Toulouse is from the North shores area in Northern Ontario, and grew up on the Sagamok Anishnawbek First Nation. She is an Ojibway from the Bear clan. Toulouse’s inspiration to design clothing came from her grandmother, who is a respected and talented quilt-maker. As a child, she would sit by her grandmother’s side to watch her sew. Toulouse followed her interests by taking clothing construction courses in high school, then continuing on to creative fashion design instruction in college. She also completed an internship with the prominent Linda Lundstrom Company as part of her graduation from a three-year Business program. Toulouse shows her work throughout Canada and is known for her modern fashion lines as well as for her creation of elaborate and intricate custom regalia for clients. The collections showcased by Toulouse are inspired by the artistic motifs found in Aboriginal culture, arts, nature and her own creativity. Her pieces feature intricate and colorful appliqué designs on sophisticated, tailored and modern garments. These fashion designs range from one-of-a-kind traditional dance outfits and regalia to entire bridal parties. Her strong connection to her culture and identity is the creative force behind her designs. Her clothing company, Swirling Wind, was named in memory of her daughter. This life change has brought Toulouse strength, wisdom and humility to strive towards her goals and live in a good way. One of her cultural teachings is to share knowledge and skills with others. Toulouse volunteers with the Children’s Aid Society’s Aboriginal Children’s Cultural Program. By sharing her knowledge of regalia-making, she hopes to reconnect Aboriginal youth with their traditional cultural values. Toulouse has been nominated for the Outstanding Achievement Award for Volunteerism in Ontario. She launched a collection named Megwakwa (in the bush), and this line is infused with the artistic motifs that are recognized in her Ojibway culture. The basis of this collection incorporates the natural fabrics of leather, wool, and cotton; accentuated by hand-carved wood buttons, pipe bone and feather plumes. The production of this line is done in Northern Ontario and is proudly made by First Nation people. Recently, she participated in the first Bee the Change Aboriginal Fine Arts and Fashion Show at the Peachfest Aboriginal Cultural Village in Penticton. 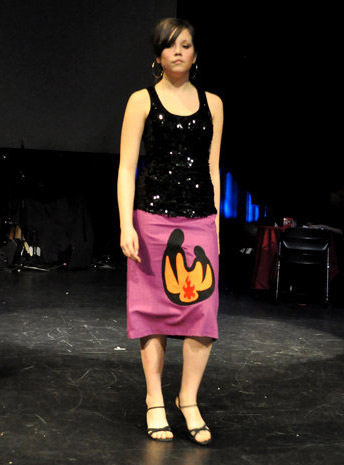 Toulouse was also a featured designer in the Fire and Fashion Live 2009 showcase in Toronto. The underlying motivation to Toulouse’s work as a textile artist is a profound belief in the spirit of the art that she puts into her clothes. The coat is absolutely delightful. How does one find your studio, or where one can purchase such a lovely coat? I recently purchased a shoulder hand bag at a pow wow in Wiky with the Swirling Wind tag sewn inside. Came home to Edmonton to oodles of appreciative ladies! they loved my bag and wanted one. Where can I direct them to get one? didnt see this handbag on this website?